GN Solids Control is an API certified manufacture for drilling mud solids control equipment. 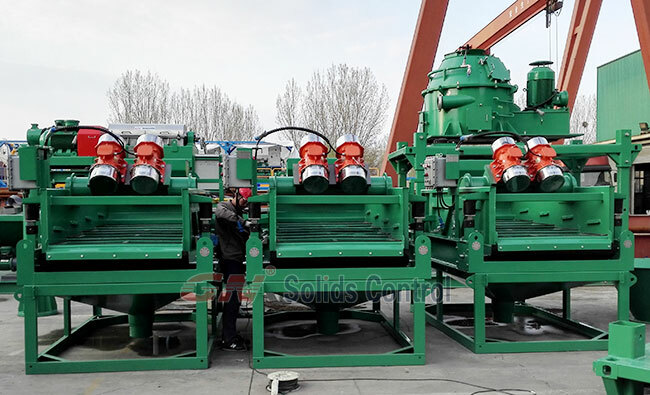 No doubt, the shale shaker unit is one of the most important equipment in our production line, in the meanwhile, shale shaker is the most important primary solids control equipment that takes place in the role of separating the coarse solids in the drilling mud as the first stage solids control equipment. The function of shale shaker to separate the solids should give credit to the mesh screen fixing on the shale shaker unit. By using different mesh screen, the shale shake unit could do separation process on different slurry. GN now has 3 main size shale shaker unit, each of them is equipped with GN self designed and manufactured shaker screen. The shale shaker models are GNZS752, GNZS703 and GNZS 594, respectively fixed with 2 panel, 3 panel and 4 panel screens. From the shale shaker model, we can find some hints of the dimension of the screen. The screen used of the shaker model 752 is 750x900mm. This shale shaker is widely used in some small capacity no dig drilling project and core drilling solids removal unit. Thus, this shaker model is also baby shaker. The shaker 703 is fixed with screen dimension of 700x1250mm; this shaker model is widely used in oil drilling and some big capacity HDD project. Based on the model GNZS703, GN does have the shaker model GNZS706 with 2 layers shaker deck, and 6 pieces screen fixed. And the GNZS705 model is often used as underflow shaker for a mud cleaner unit to further dry the solids discharged from cyclone units. While the shaker model GNZS594 is fixed 4 pcs screen with dimension of 585x1165mm. This model could be used as a primary shaker in solids control system, and it can also be used as high G force drying shaker in waste cuttings drying system. What we need do is to use two high power vibrators. Guess through this article, the client would be easily to choose GN’s shaker screen if you already had GN’s shale shaker in hand. Besides, GN can also provide replacement screen for many other brands shale shaker that widely used in the industry. Just let us know once you have the request for the shaker screen. Mud cleaner purpose for drilling fluid.